If you’re the type of person that enjoys a bit of whimsy with dessert, Yes Chocolates is going to bring a smile to your face. Crafted with charm and delight, these handmade chocolates come in an assortment of delicious flavors, such as Guava Grapefruit Goodness (“100% of your daily recommended yumminess”) and The Perfect Pour (“Guinness stout ganache in dark chocolate”). 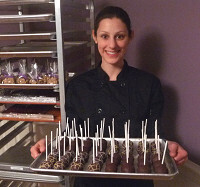 Chocolatier, Rebecca Novak, started Yes Chocolates to follow her dreams of delivering happiness through chocolate. Inspired at an early age thanks to the beloved Willy Wonka, she honed her craft at The French Culinary Institute in New York City. Striking out on her own, Rebecca creates every Yes Chocolate by hand with quality ingredients and a lot of love. Rebecca is passionate about her work and brings a dash of playfulness to all her flavors. Crafted with decadent chocolates she uses tantalizing ingredients such as zesty raspberry liqueur, milk gianduja and caramel. Perfect as a treat to yourself or a great way to impress a friend, say yes to these delicious savory chocolates. If you’re the type of person that enjoys a bit of whimsy with dessert, Yes Chocolates is going to bring a smile to your face. Crafted with charm and delight, these handmade chocolates come in an assortment of delicious flavors, such as Guava Grapefruit Goodness (“100% of your daily recommended yumminess”) and The Perfect Pour (“Guinness stout ganache in dark chocolate”). 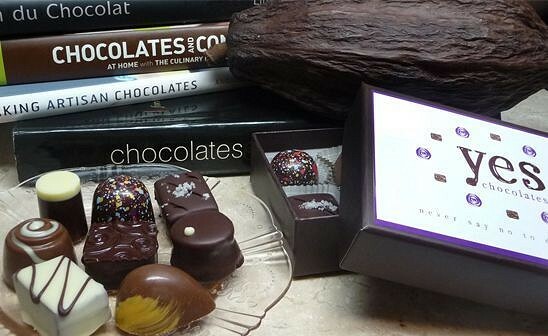 Chocolatier, Rebecca Novak, started Yes Chocolates to follow her dreams of delivering happiness through chocolate. Inspired at an early age thanks to the beloved Willy Wonka, she honed her craft at The French Culinary Institute in New York City. Striking out on her own, Rebecca creates every Yes Chocolate by hand with quality ingredients and a lot of love. Rebecca is passionate about her work and brings a dash of playfulness to all her flavors. Crafted with decadent chocolates she uses tantalizing ingredients such as zesty raspberry liqueur, milk gianduja and caramel.